Hard Drive Recovery. Three words that encompass so much. In my post about why hard drives fail I explained how hard disk manufacturers are burdened with the fact they are producing a product destined for failure. We know that inherently a drive will fail, but keep in mind that there are things that can speed up the imminent hard disk drive doom. One of the worst killer is heat. Check out my post about how heat kills hard drives if you want to read more about it. We have all heard the click of death. If you have a clicking hard drive you have minutes maybe hours at the most to back up your data. What causes the clicking? There are a couple of things that do it. If your drive is older then the most common reason for the clicking is the heads have failed. 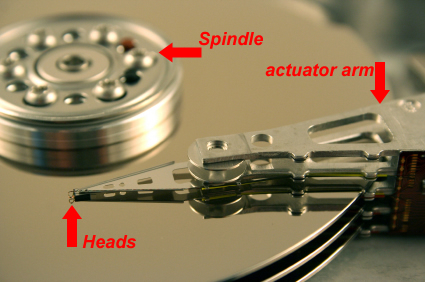 A hard disk drive has an actuator arm that holds the heads. It seeks back and forth starting at track 0. If the hard disk’s heads can no longer find track 0, they go into a seek pattern back and forth, hence the clicking hard drive. As you can see by this picture, the common parts of a hard drive are outlined in red. The next reason for clicking, and at this time the most common reason for hard drive recovery happens mostly on newer hard drives. Hard drives communicate with your computer with a language called microcode. If any part of the communication process breaks down, the heads go into a seek pattern causing the hard drive to emit a cyclic clicking sound. Even though this problem has been well documented, we still get in 3 or 4 drives a month, that have been opened in other data recovery labs. They swap the heads and can’t recover the data. Now we have to go through the whole process twice to recover the clients hard drive. Here is a sound-byte courtesy of Hitachi of a clicking hard drive. If you are hearing anything like that coming from your computer it is time to back up your data and get DTI on the phone. Call Toll Free: 1-866-438-6932 we offer 24 hour support on all types of hard drive recovery. Our data recovery software support is 9AM to 10PM. Our Exchange server support line can be reached at 727-251-2058. I have the dreaded clicking noise and it won’t stop, what can i do? Spider, the clicking is a very bad sign. It usually meens the heads are failing or failed. Other than data recovery your best hope is to try and hook the drive up as a slave and get off what data you can. Get your most important files off first and don’t try to copy over too much at one time as this will make the drive work harder. Another option is to clone the drive before it totally fails. If it doesn’t boot, or isn’t recognized in the bios, then you have to have a data recovery company fix it.